April 16: Three New York investors closed on the purchase of the Bangor Mall for $12.6 million. Feb. 25-27, 2019: Bangor Mall is auctioned on Ten-X website. Despite heated bidding during the last hour of the auction, but highest bid of $14.95 million did not meet the confidential reserve amount. That left the mall’s future in question once again. Jan. 19, 2019: The Bangor Mall is listed for sale by online auctioneer Ten-X. The starting bid for the auction, to be held Feb. 25-27, is $6.5 million. Jan. 2, 2019: MSCI 2007-1Q16 Stillwater Avenue takes over ownership of the mall, taking the deed to the mall from the previous owner instead of foreclosing on the mall. Dec. 21, 2018: Hannaford renews its lease for multiple years. Nov. 21, 2018: Sears Auto Center shuts its store at the mall. Oct. 23, 2018: City of Bangor reduces the value of the mall’s leasable space by 22 percent for fiscal 2019, which started July 1, 2018. July 17, 2018: Maine Superior Court judge rules to appoint a receiver to run the mall. July 5, 2018: MSCI 2007-IQ16 Stillwater Avenue LLC files a complaint against the Bangor Mall in Penobscot County Superior Court in Bangor to appoint a receiver to protect the mall’s assets. MSCI claims it has not received rents, among other things it is due under the loan agreement. MSCI asks that The Woodmont Co. of Texas be appointed as a receiver to protect its assets at the mall and manage them. 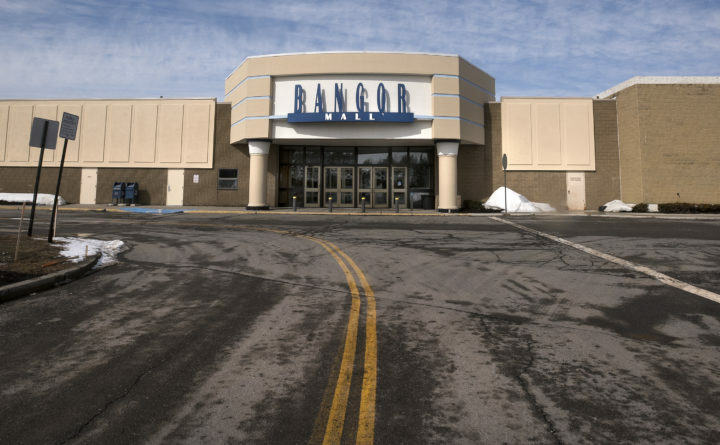 MSCI states in the filing that the court may appoint a receiver “to avoid the unintended consequences of an immediate shutdown of the [Bangor Mall].” MSCI said it reserves the right to sell the property or foreclose on it. May 7, 2018: Furniture Mattress & More leases the former Macy’s space at the Bangor Mall. April 2018: Sears, the second of four anchor stores in the mall, closes, though the Sears Auto Center remains open indefinitely. April 26, 2018: Bangor city officials deny Bangor Mall’s tax break request, saying its income is enough to pay taxes. Feb. 16, 2018: LNR sets foreclosure date for March, but lets date slip. The property has not been foreclosed upon as of mid-July. Feb. 14, 2018: Bangor Mall owner Simon Property asks the city of Bangor for large tax breaks, citing sales declines, vacancies and increased occupancy costs. Jan. 19, 2018: MSCI 2007-IQ16 Stillwater Avenue LLC, a Maine-based company, is formed to handle the mall’s property. The trustee of the Morgan Stanley Capital commercial mortgage pass-through certificate loan, which is a pooled loan among investors, signed its responsibilities for the mall’s operation over to MSCI. Jan. 18, 2018: Out of the Box Ventures LLC, a Miami subsidiary of Lionheart Capital, a real estate development and investment firm also in Miami, closed on its purchase of the former Macy’s after buying it in an online auction Jan. 16. January 2018: Simon Property says it is not interested in refinancing the loan, leaving LNR to take over running the Bangor Mall. Dec. 21, 2017: Loan trustee demands that Bangor Mall immediately turn over rents, revenue and other income in the wake of its failure to pay the loan. Dec. 20, 2017: Bangor Mall is notified by the loan trustee that it is in default on the loan. Dec. 18, 2017: Bangor Mall’s appraised real estate value plummets to $28.9 million, 77 percent less than when it took out $80 million loan in 2007. Analysts predict mall will be foreclosed upon. Oct. 1, 2017: Simon Property of Indianapolis, owner of the Bangor Mall, doesn’t pay $80 million loan. Aug. 28, 2017: With the 10-year loan’s maturity date fast approaching, lender Morgan Stanley Capital and the trustee handling the loan turn it over to LNR Partners of Miami Beach, a special loan servicer that handles troubled debts. Sept. 19, 2017: The Bangor Mall’s owner, Simon Property of Indianapolis, appeared at risk of defaulting on the $80 million loan. Spring 2017: Macy’s, one of Bangor Mall’s four anchor stores, closes. Market analysts were concerned about the closure, which was one of 63 Macy’s to shut down nationwide. January 2016: Early signs of trouble at the mall include Hallmark and New York & Co. stores closing in January. A Ruby Tuesday restaurant closed in August. Sept. 10, 2007: Simon Property takes out an $80 million loan from General Electric Capital Corp. using the mall as collateral. The intent is to grow the mall. August 2003: Simon Property of Indianapolis acquires a majority stake in the Bangor Mall. Oct. 10, 1990: Bangor Mall turns 12, continues annual tradition of big party, store discounts. October 1978: Bangor Mall opens on the site of a former dairy farm. The mall services the Bangor area and much of northern Maine, and attracts tour buses full of shoppers from Canada. August 1977: Groundbreaking for Bangor Mall.